Net Radio Communications Worldwide LLC is a collection of smaller modern specialized service-based comapnies for the business and entertainment industries. These companies are designed to save clients money by taking new and different approaches to our various fields of expertise. 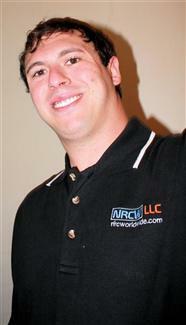 NRCW is a sole proprietorship LLC owned and operated by Drew Eppley. He is an autodidact with a huge heart and a great imagination who has invested his free time for well over the past eight years to build skills to build an impressive portfolio. Drew's goal is to always be up-to-date on the latest technologies and has donated his time practicing, learning and building his talents towards many non-profit organizations, friends and even fans. He now has a total of 14 years working in commercial media and has professional management experience in various fields of work and on-the-job training in marketing, advertising, sales and customer service. NRCW LLC was officially formed on January 1, 2008 in Pennsylvania but Drew's ideas and websites started to pop up as early as 2003 with websites such as www.carlisletabletennis.org and www.epstylez.com. He devotes his free time to preparing the company for what it will have to offer once the mainstream corporations and media begin to recognize the name. Many of these self-developed technology and multi-media solutions have been developed as sandbox projects to add to the NRCW LLC portfolio but since 2010 we have started taking a real-life approach to his projects (and the companies are getting enough attention to stay busy)! Drew registered his second company, The MAPP LLC, in 2011 in Ohio operating as a forign entity DBA. Drew hopes that this well-established portfolio will lead to the freedom and independence that no other job in the world can provide him. He still is a full time employee of the local school district and balances his contract work (NRCW LLC) with his primary income. For a more personal background on Drew click here. You may also follow his blog. Drew takes pride in not only providing commercial services to his clients but in the past he has enjoyed donating his time to the community and non-profit organizations. Unfortunately his love for web, media nad marketing was coming before his own health and he can no longer offer free or discounted projects to organizations like he did in past years. Drew has also created or made attempts to create a variety of non-profit groups and organizations such as The Free Chamber of Commerce (now closed) and Club MYX (soon seeking to commercialize)! Our products and services cover a wide variety of items from custom audio production (remixes) for DJs and dance teams / performances and other licensed labels (CMYX Studios) and voice-over talent tracks. NRCW Records is a source for musicians and DJs. Project HxO is our energy / science research and development center. NRCW web design hold the power to some of the latest and open-source applications and works every day in developing new content management system features and customs scripting for the future needs of clients. NRCW Enterprises is a collection of beta companies under development; the pride and joy of NRCW LLC, where we match the needs of the people. If the world needs a company solely devoted to producing [whatever], we will create it, enhance it and make it reality, and a lot cheaper than any competitor willing to give you your own agent and endless support! The latest statistics show over 7,600,000 visitors (July 2011) have visited NRCW LLC websites showing over twenty-three million page views network wide each year. Compare this to the city of Cincinnati where the population is only about 3 million people and you are sure to be impressed! These numbers are always increasing too. We have increased one organizations size (www.cincyahl.com) by over 300% in just one year (400% in three years). Statistics are great and are a great honor to share but are not as important as what we actually do for companies. How we do it is also an 85% open book for our clients to learn how to do what we do so we can move on and teach a new company the tools of the trade and continue to expand. Trade secrets are a very powerful asset to NRCW LLC and we have designed these talents, abilities and skills from our own experience only. Some clients have noted that because Drew did not finish his masters degree in college and took his own path, he actually benefited greatly from learning on his own. This is one reason why companies will pay top dollar for new and unique methods, ideas, skills and abilities that you cannot find anywhere else in the world! College is a great tool in building job skills for the most common areas of professionalism from business management to skilled trades but college also does not allow a completely free platform to build skills and abilities that are 100% unique. Drew's vision is to create a growing company that specializes in a variety of web and media services which is unique and unlimited in the ability to hire new staff and expand to amazing levels. He hopes to be able to provide employment for well selected skilled employees within a few years. Read more about his vision and mission here.